Fashion in fourteenth-century Europe was marked by the beginning of a period of experimentation with different forms of clothing. 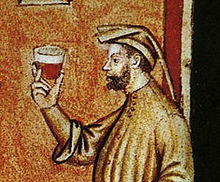 Costume historian James Laver suggests that the mid-14th century marks the emergence of recognizable "fashion" in clothing, in which Fernand Braudel concurs. The draped garments and straight seams of previous centuries were replaced by curved seams and the beginnings of tailoring, which allowed clothing to more closely fit the human form. Also, the use of lacing and buttons allowed a more snug fit to clothing. Woodblock printing of cloth was known throughout the century, and was probably fairly common by the end; this is hard to assess as artists tended to avoid trying to depict patterned cloth due to the difficulty of doing so. Embroidery in wool, and silk or gold thread for the rich, was used for decoration. Edward III established an embroidery workshop in the Tower of London, which presumably produced the robes he and his Queen wore in 1351 of red velvet "embroidered with clouds of silver and eagles of pearl and gold, under each alternate cloud an eagle of pearl, and under each of the other clouds a golden eagle, every eagle having in its beak a Garter with the motto hony soyt qui mal y pense embroidered thereon." A robe, tunic, or kirtle was usually worn over the shirt or doublet. As with other outer garments, it was generally made of wool. Over this, a man might also wear an over-kirtle, cloak, or a hood. Servants and working men wore their kirtles at various lengths, including as low as the knee or calf. However, the trend during the century was for hem-lengths to shorten for all classes. However, in the second half of the century, courtiers are often shown, if they have the figure for it, wearing nothing over their closely tailored cotehardie. A French chronicle records: "Around that year (1350), men, in particular, noblemen and their squires, took to wearing tunics so short and tight that they revealed what modesty bids us hide. This was a most astonishing thing for the people". This fashion may well have derived from military clothing, where long loose robes were naturally not worn in action. At this period, the most dignified figures, like King Charles in the illustration, continue to wear long robes—although as the Royal Chamberlain, de Vaudetar was himself a person of very high rank. This abandonment of the robe to emphasize a tight top over the torso, with breeches or trousers below, was to become the distinctive feature of European men's fashion for centuries to come. Men had carried purses up to this time because tunics did not provide pockets. Edward's son, King Richard II of England, led a court that, like many in Europe late in the century, was extremely refined and fashion-conscious. He himself is credited with having invented the handkerchief; "little pieces [of cloth] for the lord King to wipe and clean his nose," appear in the Household Rolls (accounts), which is the first documentation of their use. He distributed jeweled livery badges with his personal emblem of the white hart (deer) to his friends, like the one he himself wears in the Wilton Diptych (above). In the miniature (left) of Chaucer reading to his court both men and women wear very high collars and quantities of jewelry. 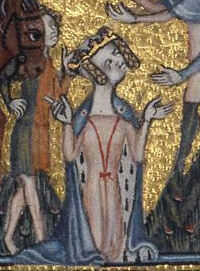 The King (standing to the left of Chaucer; his face has been defaced) wears a patterned gold-coloured costume with matching hat. Most of the men wear chaperon hats, and the women have their hair elaborately dressed. Male courtiers enjoyed wearing fancy-dress for festivities; the disastrous Bal des Ardents in 1393 in Paris is the most famous example. 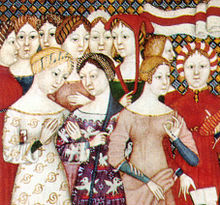 Men, as well as women, wore decorated and jewelled clothes; for the entry of the Queen of France into Paris in 1389, the Duke of Burgundy wore a velvet doublet embroidered with forty sheep and forty swans, each with a pearl bell around its neck. A new garment, the houppelande, appeared around 1380 and was to remain fashionable well into the next century. It was essentially a robe with fullness falling from the shoulders, very full trailing sleeves, and the high collar favored at the English court. The extravagance of the sleeves was criticized by moralists. In armour, the century saw increases in the amount of plate armour worn, and by the end of the century the full suit had been developed, although mixtures of chain mail and plate remained more common. The visored bascinet helmet was a new development in this century. Ordinary soldiers were lucky to have a mail hauberk, and perhaps some cuir bouilli ("boiled leather") knee or shin pieces. For hawking, this woman wears a pink sleeveless dress over a green kirtle, with a linen veil and white gloves. Codex Manesse, 1305–40. All classes and both sexes are usually shown sleeping naked—special nightwear only became common in the 16th century—yet some married women wore their chemises to bed as a form of modesty and piety. Many in the lower classes wore their undergarments to bed because of the cold weather at night time and since their beds usually consisted of a straw mattress and a few sheets, the undergarment would act as another layer. Over the chemise, women wore a loose or fitted dress called a cotte or kirtle, usually ankle or floor-length, and with trains for formal occasions. Fitted kirtles had wide skirts made by adding triangular gores to widen the hem without adding bulk at the waist. Kirtles also had long, fitted sleeves that sometimes reached down to cover the knuckles. Various sorts of robes were worn over the kirtle, and are called by different names by costume historians. When fitted, this garment is often called a cotehardie (although this usage of the word has been heavily criticized) and might have hanging sleeves and sometimes worn with a jeweled or metalworked belt. Over time, the hanging part of the sleeve became longer and narrower until it was the merest streamer, called a tippet, then gaining the floral or leaflike daggings in the end of the century. Sleeveless dresses or tabards derive from the cyclas, an unfitted rectangle of cloth with an opening for the head that was worn in the 13th century. By the early 14th century, the sides began to be sewn together, creating a sleeveless overdress or surcoat. As one might imagine, a woman's outfit was not complete without some kind of headwear. As with today, a medieval woman had many options- from straw hats, to hoods to elaborate headpieces. A woman's activity and occasion would dictate what she wore on her head. The Middle Ages, particularly the 14th and 15th centuries, were home to some of the most outstanding and gravity-defying headwear in history. Before the hennin rocketed skywards, padded rolls and truncated and reticulated headdresses graced the heads of fashionable ladies everywhere in Europe and England. Cauls, the cylindrical cages worn at the side of the head and temples, added to the richness of dress of the fashionable and the well-to-do. Other more simple forms of headdress included the coronet or simple circlet of flowers. Married women in Northern and Western Europe wore some type of headcovering. The barbet was a band of linen that passed under the chin and was pinned on top of the head; it descended from the earlier wimple (in French, barbe), which was now worn only by older women, widows, and nuns. The barbet was worn with a linen fillet or headband, or with a linen cap called a coif, with or without a couvrechef (kerchief) or veil overall. It passed out of fashion by mid-century. Unmarried girls simply braided the hair to keep the dirt out. The barbet and fillet or barbet and veil could also be worn over the crespine, a thick hairnet or snood. Over time, the crespine evolved into a mesh of jeweler's work that confined the hair on the sides of the head, and even later, at the back. This metal crespine was also called a caul, and remained stylish long after the barbet had fallen out of fashion. For example, it was used in Hungary until the beginning of the second half of the 15th century, as it was used by the Hungarian queen consort Barbara of Celje around 1440. Women at dinner wear their hair confined in braids or cauls over each ear, and wear sheer veils. The woman on the left wears a sideless surcoat over her kirtle, and the woman on the right wears a dress with fur-lined hanging sleeves or tippets. Luttrell Psalter, England, c. 1325–35. A bride wears a long fur-lined dress with hanging sleeves over a tight-sleeved kirtle, with a veil. Her gown is trimmed with embroidery or (more likely) braid. A royal lady wears a blue mantle hanging from her shoulders; her hair is worn in two braids beneath her crown, Italy, 1350s. Footwear during the 14th century generally consisted of the turnshoe, which was made out of leather. It was fashionable for the toe of the shoe to be a long point, which often had to be stuffed with material to keep its shape. A carved wooden-soled sandal-like type of clog or overshoe called a patten would often be worn over the shoe outdoors, as the shoe by itself was generally not waterproof. Images from a 14th-century manuscript of Tacuinum Sanitatis, a treatise on healthful living, show the clothing of working people: men wear short or knee-length tunics and thick shoes, and women wear knotted kerchiefs and dresses with aprons. For hot summer work, men wear shirts and braies and women wear chemises. Women tuck their dresses up when working. 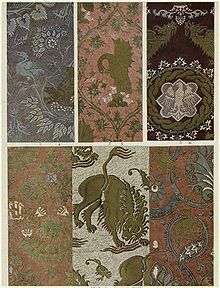 ^ There is a famous surviving example in the Textile Museum at Lyon, called the "Pourpoint of Charles of Blois". It is made of highly tailored silk brocade (a total of twenty pieces of the brocade) with gold threads and lined with linen canvas. It is quilted throughout, probably stuffed with cotton. Description and photos Archived 2009-10-19 at WebCite and another photo, several in colour. Archived 2009-10-19.